i just love when inspiration sneak ups and smacks you in the face with a good idea! a couple weekends ago i found a large vintage embroidery hoop at an antique shop. i had no idea what i’d do with it, but i decided to buy it anyway… and it was only $10. what a deal! this weekend i was looking at the empty hoop and was inspired to create a new fall display with it … complete with a spider web. if i have to say so myself, i really pleased with the results! unique, fresh, fun, and colorful! what more could i ask for? so here’s how the spider web hoop came together. 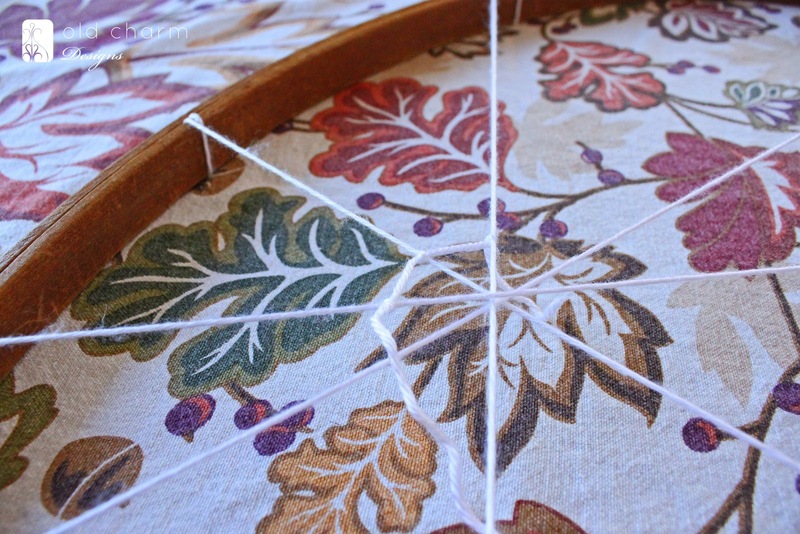 first, if you don’t have an vintage embroidery hoop laying around, you can easily use a new embroidery hoop from your local fabric shop. feel free to age it with some stain or paint if you wish. next, using white yarn, i tied six strings of fabric onto the inner portion of the embroidery hoop. when tying on your strings, be sure they all intersect at one common point. i decided i wanted my intersection point to be off centered. then, reattach the outer hoop. once that’s done you need to start creating the web. 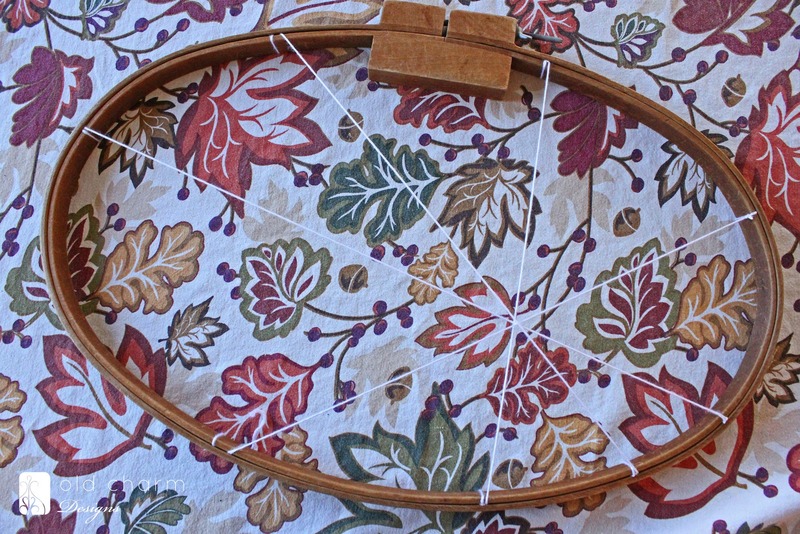 cut a piece of yard and attach it, with a knot, to one of the strings on your hoop. starting towards the center, work in a clockwise fashion (or in my case counterclockwise) attaching your yarn to each piece of string on your hoop. it may take a couple times for you to get the tension right between each string. just keep trying. i had a hard time at first but after a couple tries i got a rhythm and the whole thing came together nicely and fairly quickly. 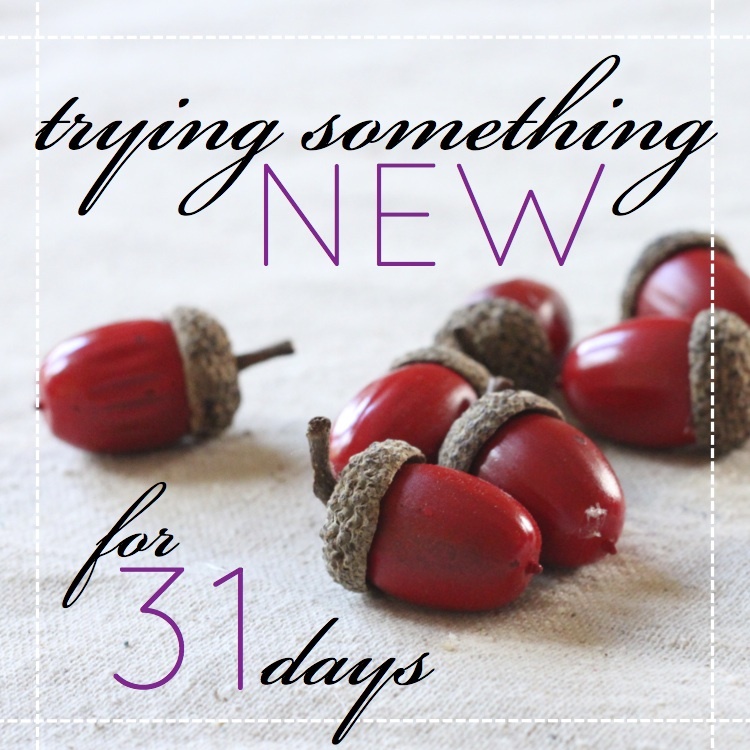 once you finish one row, start a new row, with a new piece of string. 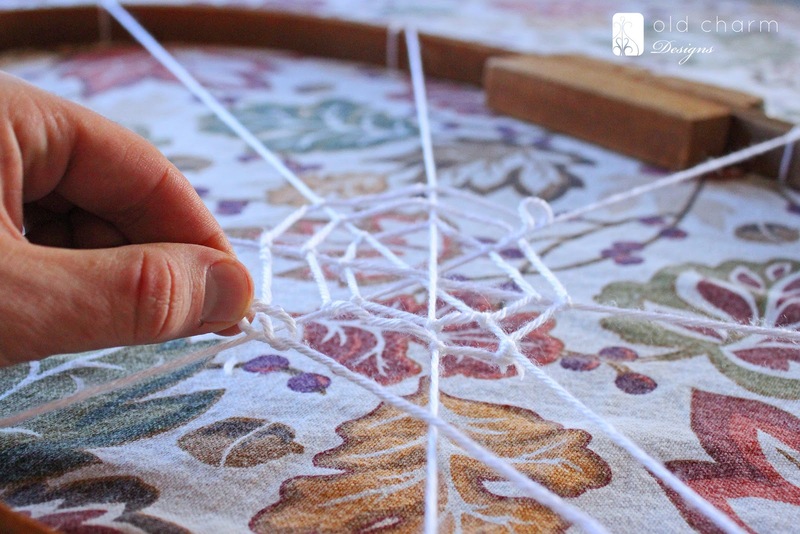 as you continue to add rows, pull the string from you newly added rows outward to create more tension between the strings. continue adding rows of yarn until you are satisfied with the look. 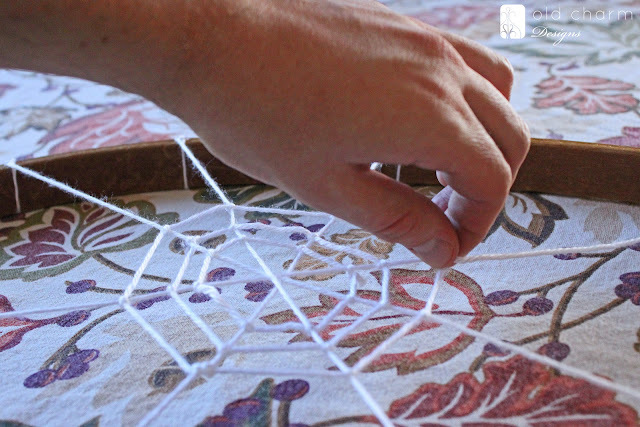 and you’ll have a super cute spider web! i also added one of those really cute spiders from my shoppe to complete the look! 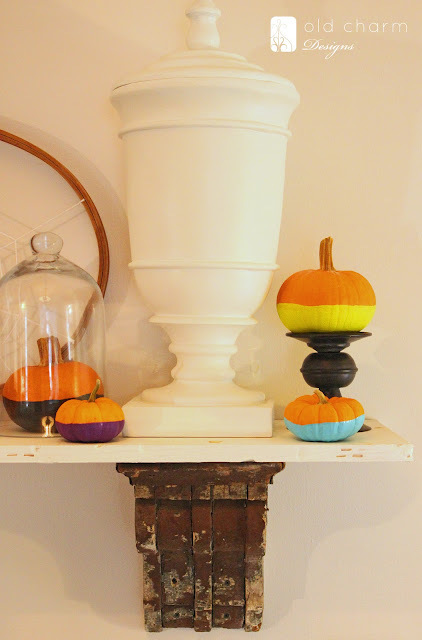 for the rest of the display i made some paint dipped pumpkins! i admittley started off by actually dipping the pumpkins in paint. FAIL. i had to use a lot of paint, the process was really messy and trying to get them to dry all the way around with out dripping wasn’t easy. instead i placed the pumpkin upside down on a drinking glass and used a small foam brush and just painted the pumpkin. the crisp edge on the foam brush gave me a clean line and no brush strokes. plus there was no mess and the pumpkin could dry completely on the glass. once dry, i arranged my little display adding in some glass cloches and black pillar candle holders. and that’s it! a festive new display. as always, i’d love to know what you think! how’d i do? will you be trying either of these projects? oh my gosh… do I say that every time I comment here? 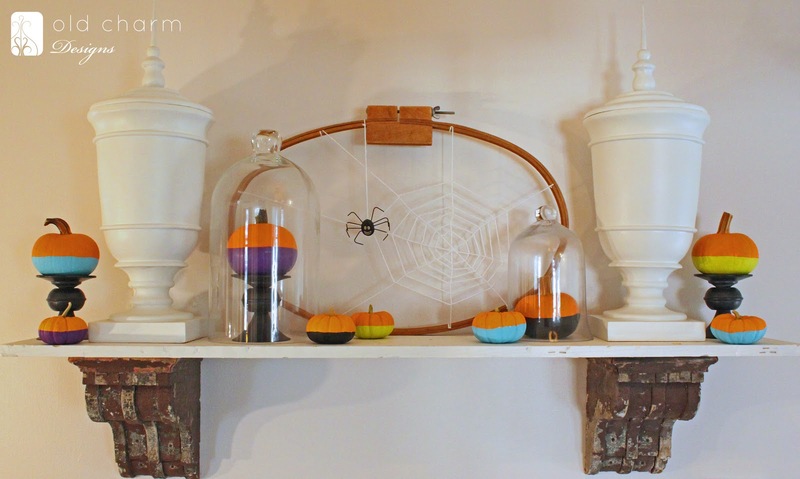 No idea… but that spider web is the most awesome idea ever! I love this display. The hoop is so cool. Wouldn’t it be great with a doily, too? 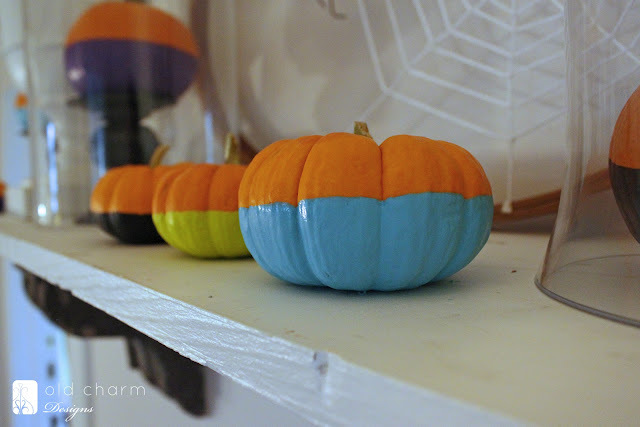 I also just did a painted pumpkin project,too. Love yours. This is a great use for your vintage embroidery hoop. 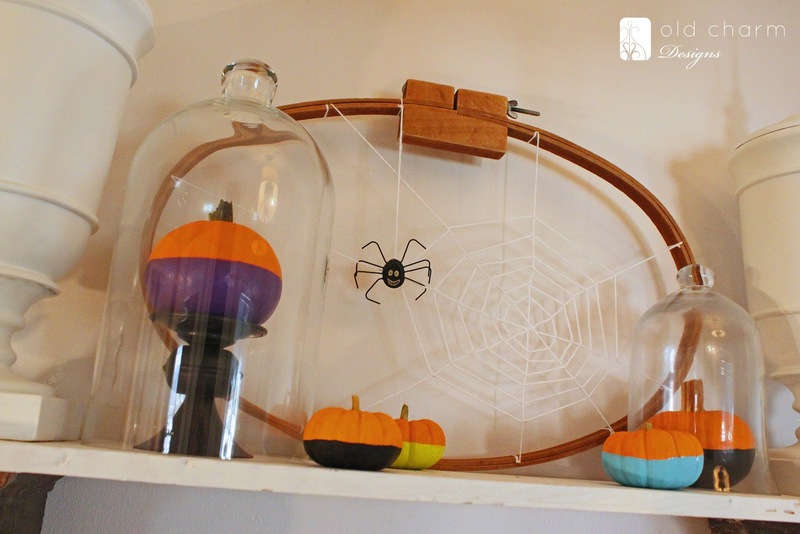 I really like that your project can easily be taken apart after Halloween so that you can use the hoop for its original purpose or to decorate for another holiday. I love love love it! 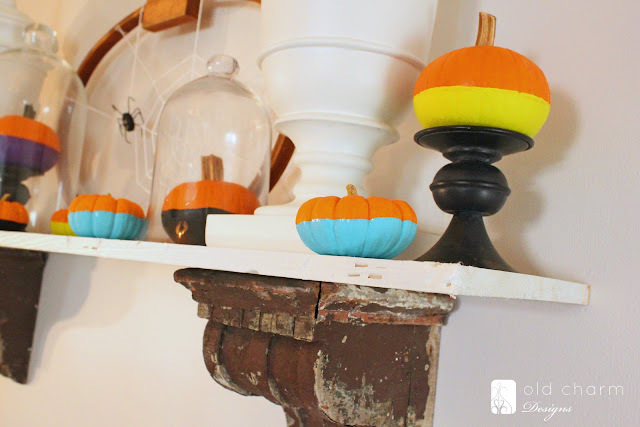 Thos pumpkins are fantastic and they totally look “dipped.” The web in the hoop is perfect too. You rocked it! I love everything about this! It’s unique and clever and so colorful and cute. Great job! absolutely fantastic! i love it and admit i am jealous as i had been wanting to make a hoop web but my tries had failed. yer tutorial is WONDERFUL! thank you for sharing.and the pumpkins are super spiffy! Love the spider web! And the apple picture in your header has me drooling. TFS! wow really like your blog, you are very talented..
I’m doing some major catching-up with your blog, Michael–sorry for so many comments at once! 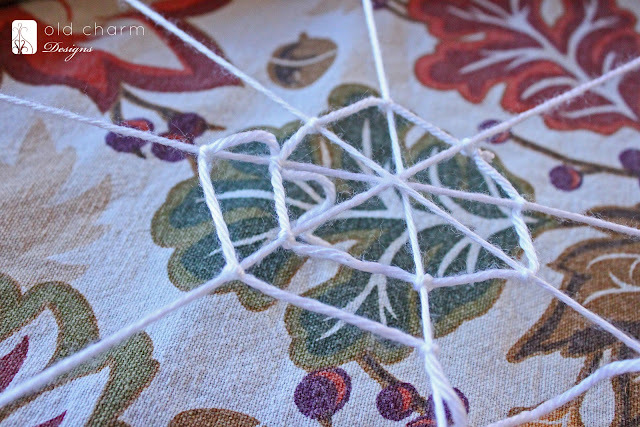 Your spider web craft is totally precious. Anything involving embroidery hoops is always awesome. And I’m DYING over your architectural salvage shelf…that thing is amazing! 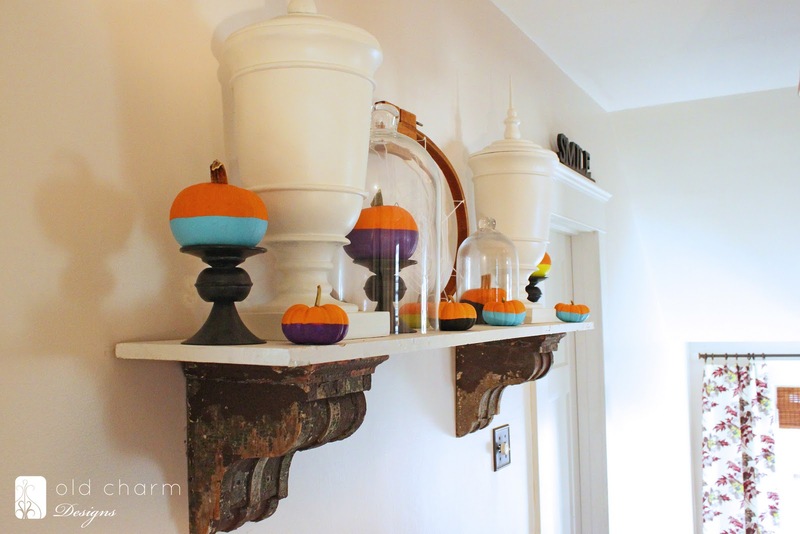 With that project and the ladder-turned-wall shelf you posted earlier this year, you have the best ideas for creating shelving from unexpected pieces. Great job Michael! It looks great! Well, You made certain nice topics in your post. I did a search on the subject matter and found the majority of people likes to visit your site for this issues. Love all of your clever ideas. that spiderweb is soo neat. and I’m definitely going to try the pumpkin dipping. Love the fresh feeling of your display! I want some of those bracket holding up the shelf!